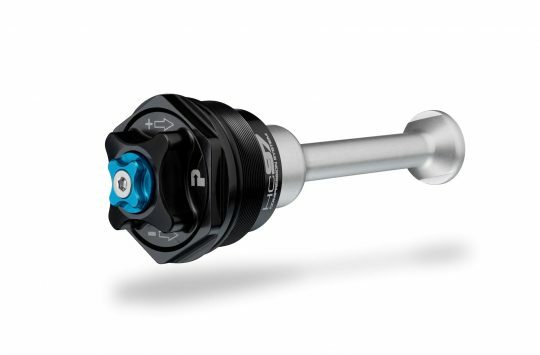 As mountain bike fork and shock performance continues to improve year-on-year, adjustability and tuneability of those forks and shocks is also improving. In order to match our growing expectations of what modern forks and shocks should be capable of, more companies are increasing the ability for us to mess around the suspension characteristics in a way that doesn’t require a degree in fluid dynamics. The RockShox Bottomless Token system is a user-friendly way of altering the progression in your fork. 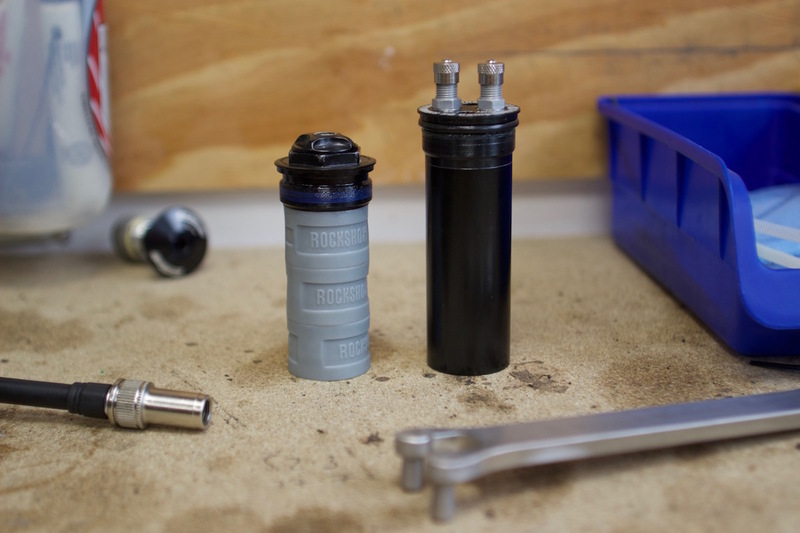 Using a series of plastic chips that thread into the underside of the air spring top cap, the Bottomless Token system allows the rider to increase or decrease the volume of the positive air spring, and therefore altering the characteristics of the spring. Bottoming out too much? Add a token to increase progression. Not using all the travel? Take out a token for a more linear feel to the end of the travel. It’s simple, easy to understand, and it works well. 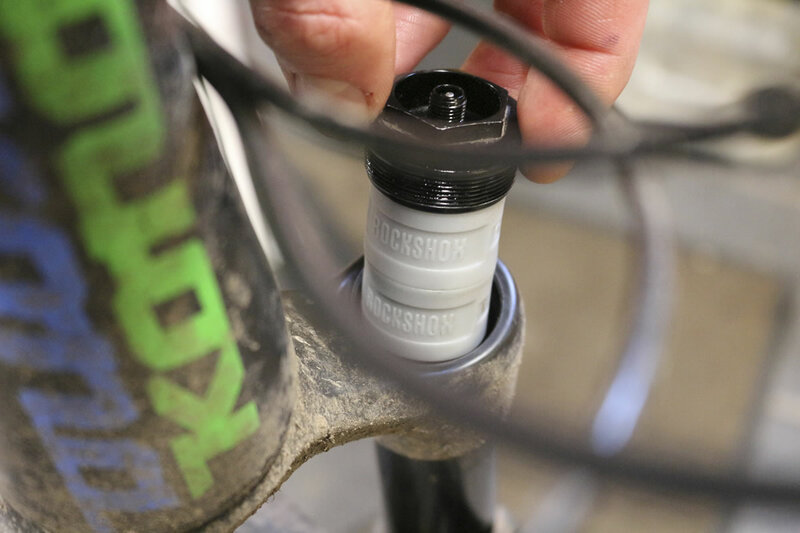 In response to RockShox’s excellent (and thoroughly user-friendly) Bottomless Token system, other brands have adopted similar style adjustable air springs with clip-in volume spacers, including Fox Racing Shox and DT Swiss. Alongside those brands, there are some smaller companies who are pushing the design envelope a little further to enhance adjustability and function in a way that they believe takes performance to the next level. 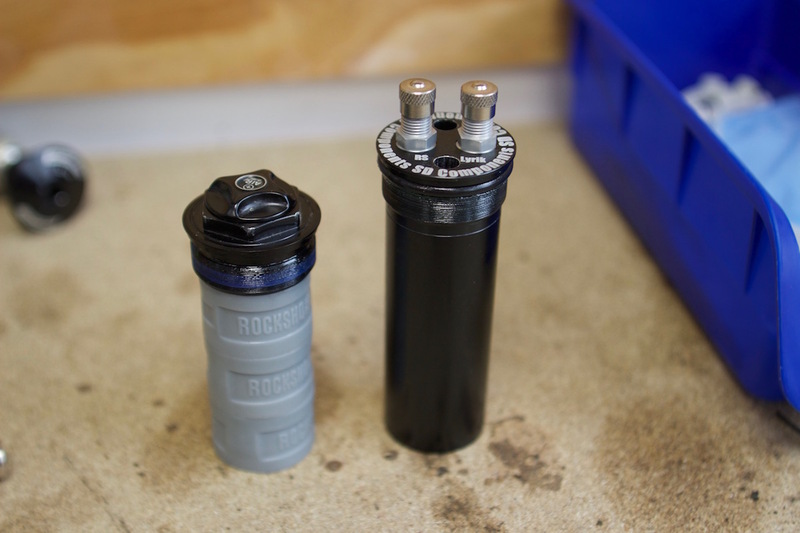 We’ve seen the clever Ramp Control Cartridge from MRP that’s available to suit both RockShox and Fox forks, and more recently, Vorsprung’s Luftkappe air spring for Pike, Lyrik and Yari forks. Adding to the list of aftermarket suspension upgrade kits is a small Australian company called SD Components. The SD Components DVC cartridge is designed to replace the air top cap and Bottomless Tokens inside your Pike or Lyrik fork. SD Components isn’t a new name to us. I spotted the original prototype design of the DVC cartridge when I visited Melbourne earlier this year. 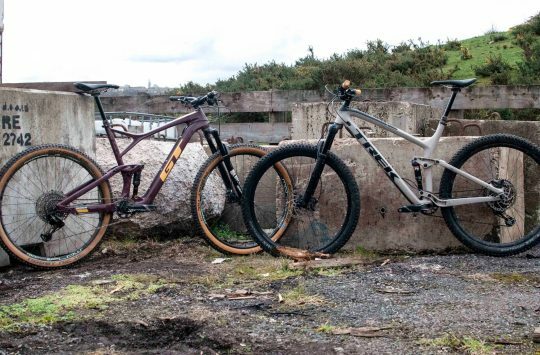 And having heard about the design and purported characteristics, I was keen to see how it would all work on the trail. Having finalised the production version, Simon from SD Components dropped us a line to send a DVC cartridge our way to test and review. But what exactly is it? And what does it do? The chamber is pressurised, providing adjustable ramp control for more or less bottom-out resistance. 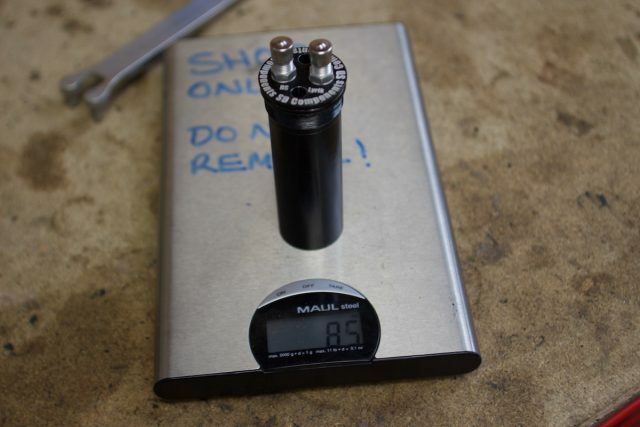 Standing for Dynamic Volume Chamber, the DVC cartridge is available in two versions; one to suit newer Boost’d Pike and Lyrik forks, and one to suit older Pike and Boxxer forks. It costs $260 AUD, which converts to around £157. That includes the custom pin spanner for installation and removal of the DVC. Like the MRP Ramp Control unit, the DVC is designed to replace the stock top cap and Bottomless Token system. However, it’s function is different. It’s a sealed air chamber, and it features two valves on top – one to adjust the positive air pressure inside the fork like you normally would, and a secondary valve that adjusts the air pressure inside the DVC. The DVC comes with a custom pin spanner tool for installation and removal. While the DVC is designed to replace the Bottomless Token system, there are differences in its behaviour, and the key is in the name. 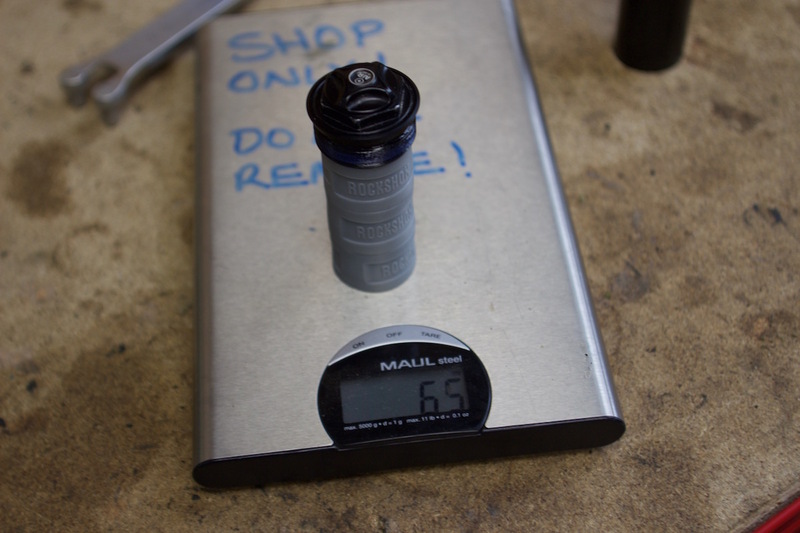 As your fork compresses and air pressure builds inside the positive air chamber, the bottom cap of the DVC chamber compresses upwards into the chamber. Put more pressure into the chamber, and the bottom-out force is increased. Put less pressure into the DVC chamber, and bottom-out force is decreased. 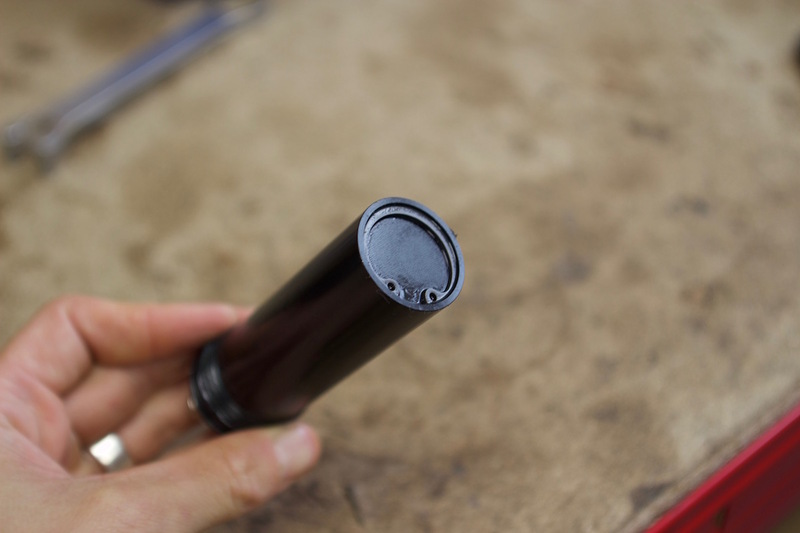 Unlike a fork fitted with Bottomless Tokens however, the DVC means the volume inside the air spring on your fork actually changes throughout the travel. 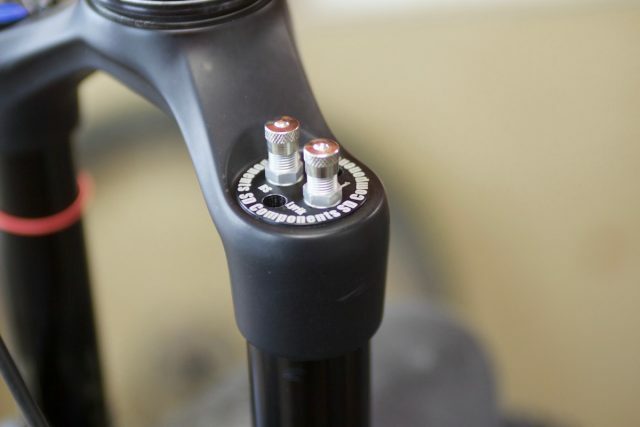 In this way, it controls the air spring volume inside the fork dynamically, rather than statically. SD Components isn’t the first brand to do this, as Chickadeehill has also delivered an adjustable bottom-out chamber with its AWK system. Valve 1 adjusts the positive spring pressure, and Valve 2 adjusts the DVC pressure. According to Simon at SD Components, the advantage of the DVC system is that “it allows you to adjust the small bump and mid support relatively independently of the ending stroke ramp up“. 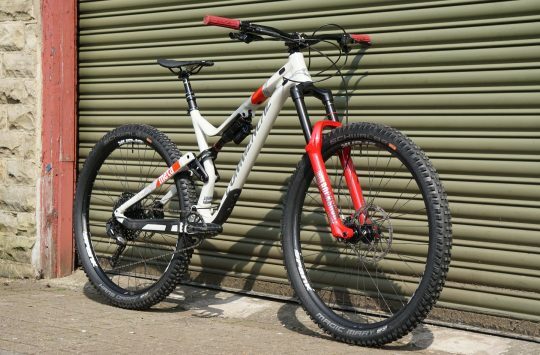 So you can have more control over the shape of the air spring curve, depending on what characteristic you’re looking for, and how you want to balance the fork’s performance with the rear travel on your full suspension bike. Overall, it’s designed to provide you with more adjustability, more control over the spring curve, and the ability to chase a coil-like feel. Running higher pressure inside the positive air chamber increases support through the start and middle portion of the travel. Or for increased bottom out support, add pressure to the DVC. Weight is 85g for the DVC cartridge. Compared with 65g for the stock top cap and three Bottomless Tokens. 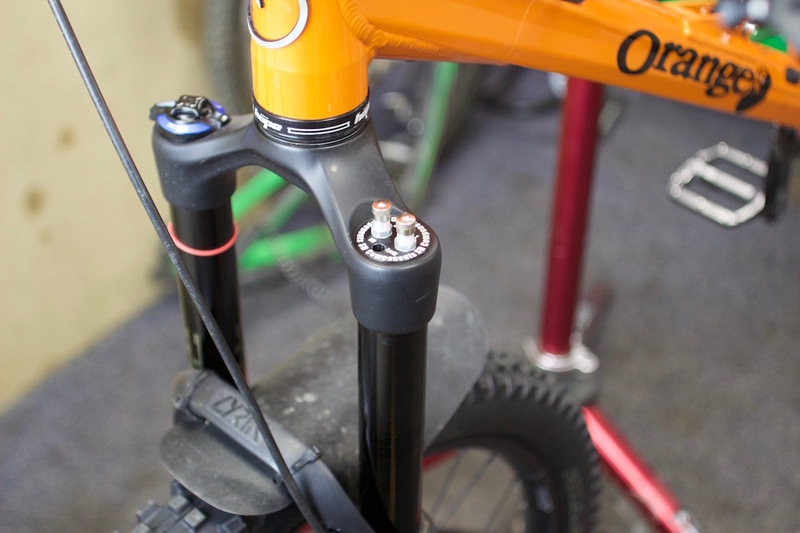 We’ve got the SD Components DVC cartridge threaded into a 160mm travel Lyrik fork aboard an Orange Stage 6. As to the performance on the trail? We’ll be experimenting over the coming weeks to see just how effective the adjustable dual-air spring is with the DVC system. One concern we have is with friction in the added seals that are required for the DVC cartridge, and whether the slightly choppy spring curve shown on the above graphs will be felt out on the trail. If you want more information on the SD Components range, including the DVC cartridge and the aftermarket Charger Damper kit, check out the SD Components website. Oh, I thought the choppy curve was only because of how they’d plotted it rather than how the device functions. Be interesting to read how it rides. @wwaswas – we’re still chasing confirmation on that one, as it does look a little odd. There will of course be more friction in the air spring due to that additional dynamic seal inside the DVC, but hopefully it doesn’t manifest like that graph suggests it will. We’ll keep you posted and update the article with any comment from SD Components as we get it! You’d assume there’d be some initial stiction but after that the effect of the additional friction would be linear. Thanks, I’ll check for updates! I expect the choppiness is real as the seal stiction breaks each time the added chamber reacts to increasing pressure in the primary spring chamber. The graph is typically smooth because the air spring piston is coupled to the wheel, so once it breaks it continues to move relatively smoothly. The small piston is directly coupled to nothing so it has to overcome seal friction to move as the pressure on it increases, probably overshoots a tiny bit and stops, and then repeats the process all the way through its travel. That said, I doubt it can be felt or significantly degrades the desired result.